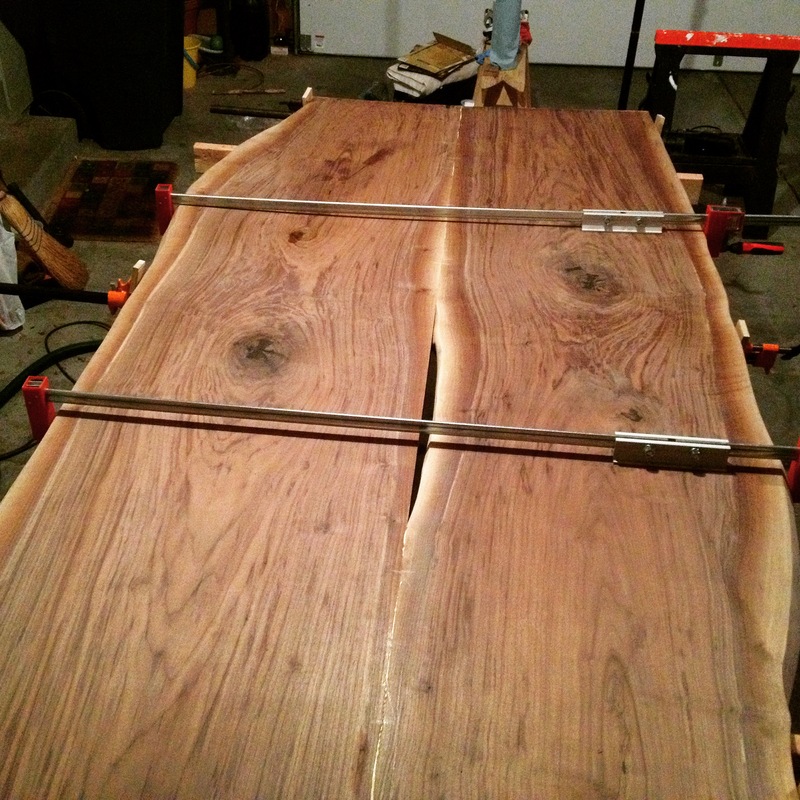 Before I glued up the top, there were a few things I wanted to do first – fill in large voids with epoxy, add some butterfly inlays or keys to two knots and a split, even out any discrepancies in the thickness of the two planks, and then get a few coats of finish on the underside of the table. There were several “firsts” with this project and one of them was using epoxy to fill a void. It wasn’t terribly difficult, though at times it felt like I was trying to fill the Grand Canyon because of how much epoxy I was pouring into the larger voids. But I guess it was all spreading out and stabilizing the knot, so I’m not really complaining. For good measure, though, I inlaid a few butterfly inlays or keys through the knots and a split that was coming off of one of them. 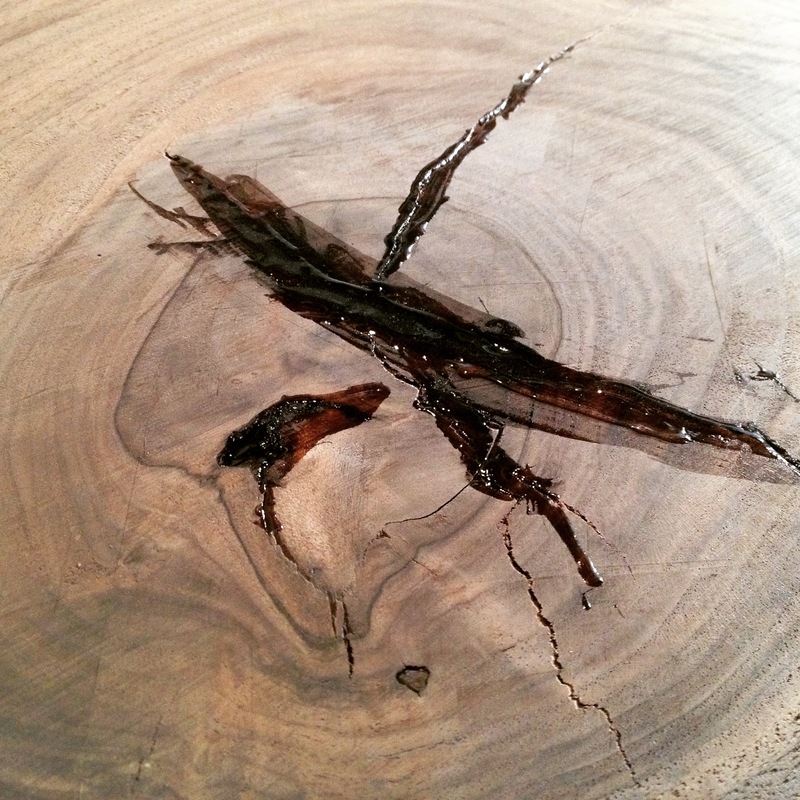 I used kiln-dried bog oak from Adamson and Low. I’m pretty sure I didn’t need to inlay these a full ¾” deep, but I was going to be doing a series of them later where I did want the extra depth, so I figured I’d just set my tools up once and be done with it. Part 4 of this series will outline my technique for adding a butterfly inlay, so you just get a picture now. 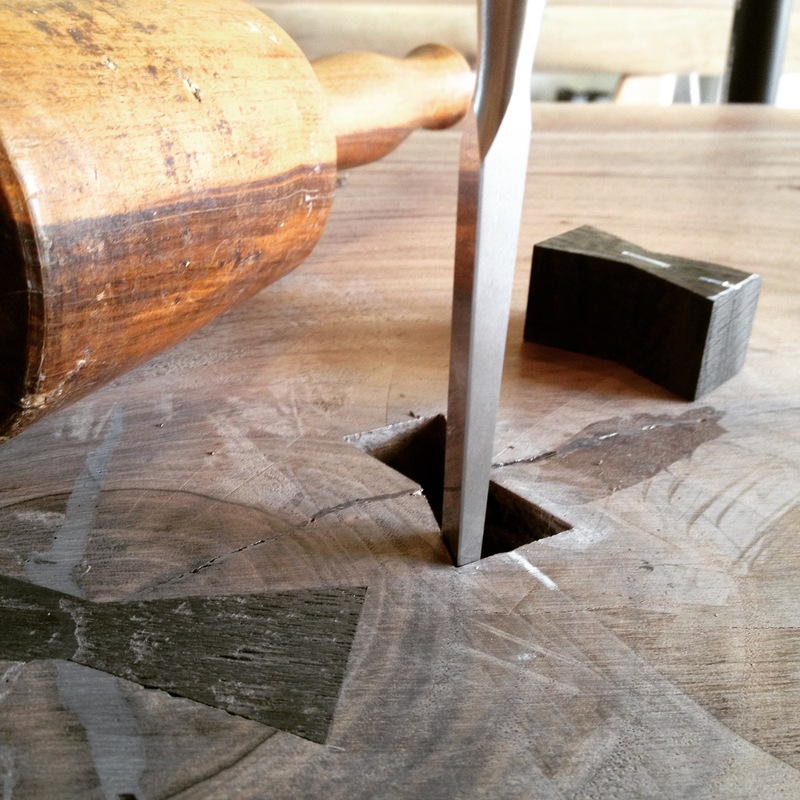 Or maybe two pictures… Chris Schwarz recently posted about adding butterfly keys to a table top. He said he uses dovetail angles for his butterfly angles. 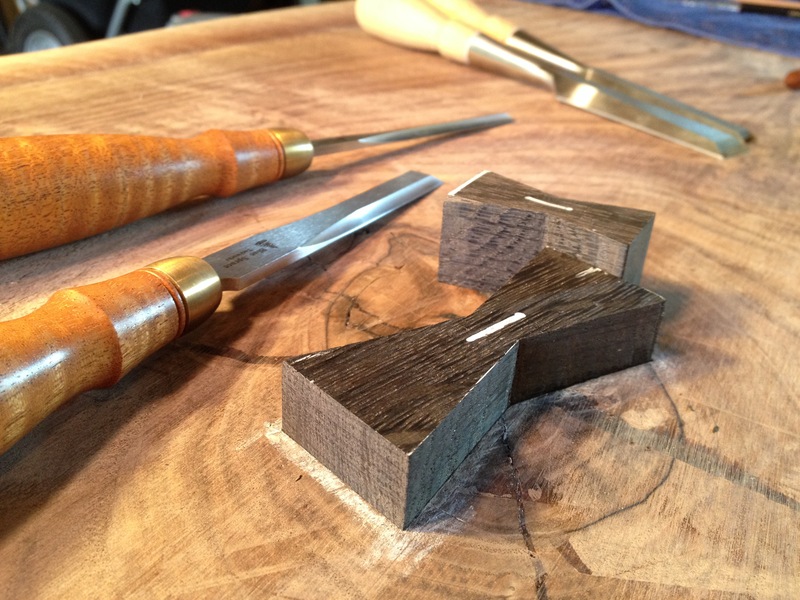 Personally, I use the angle of the side bevels of my Lie-Nielsen 3/8” chisel to determine the angles of the inlays. Kidding. That was just fortuitous; it made cleaning the corners up very easy. No, I used graph paper and laid out 1:8, 1:6, and 1:4 ratio angles and decided I preferred the steeper 1:4 ratio, so that is what I used. The inlays are just about 3” long or so; I’d read in several places that anything longer than that started to compromise the strength of the key. Since mine are more structural than decorative, I didn’t want to do that. I didn’t take any pictures of the next part, but in order to make sure the top side of the two planks was coplanar, I used a biscuit jointer (also borrowed from Michael) to cut about six biscuit slots in both boards, referencing the top side each time. I made sure to avoid the last eight inches of either end of the planks so I didn’t cut through a biscuit when I was trimming the ends. This was my first time using a biscuit joiner, but I’d seen enough examples of that happening to other people and I’d rather learn from their mistakes than make my own! When I flipped the planks over, I inserted the biscuits (dry) and clamped up the top. That left my top (relatively) flush and I could see where I needed to work the underside. I thought that was a rather brilliant idea, myself, and it really paid off. Once I had the underside prepped, I went ahead and applied a few coats of finish to it before I flipped them back over. The underside received a few coats of finish before I glued it all up. Throughout this build, I’ve put a lot of time, thought, and consideration into decisions when it mattered the most, especially when I was working on something that would normally be quite stressful. Having spent several hours making sure the two planks joined together with only the lightest of clamping pressure, aligning the top with biscuits, and adding several clamping areas during the modification of my “lie” edges, the glue-up was really not that stressful. One thing I did to aid in clamping, aside from creating flat clamping spots when I was working the live edges, was to add cork-faced poplar clamping pads to all of my clamps. Being softer than walnut, I hoped the poplar would crush before it distorted my table edges. 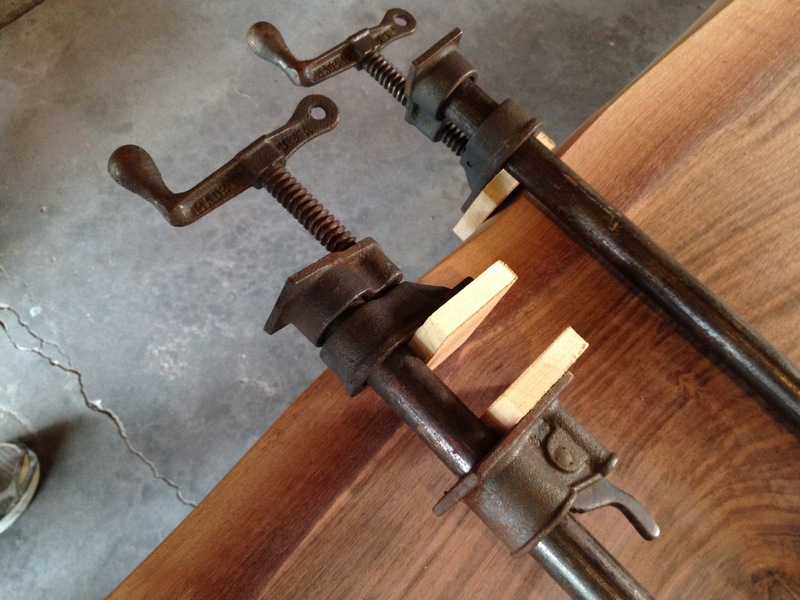 I also got a chance to use some new-to-me antique pipe clamps I picked up for a song off of Craig’s List last summer. I love these antique pipe clamps! So, anyway, I clamped up the top. Because of the width of the boards, I really didn’t need that many clamps to exert the proper pressure across the joint. Nothing special in the steps, though – clamps laid out under the table ready to go, lots of glue, proper pressure starting from the middle and going out, you know the drill. I got good glue beads with moderate clamping pressure. And, sure enough, the poplar crushed and gave before the walnut in almost every case; I did have to touch up one spot where the clamp did a tiny bit of damage. I kept them on for a full 24 hours, just to be sure. You can’t easily see them, but I had three clamps on the underside, as well. Once the top was glued up, I was able to cut the ends square. The entire process took me about an hour. No, I didn’t do it with a 20 tpi razor saw. I used blue painter’s tape to lay out various options – cutting to keep as much of the top as possible, even it if wasn’t square vs. cutting it straight across vs. any other configuration I could come up with – before I made any cuts. Again, the time was well-spent. I ultimately decided to cut them straight across; I figured there was enough “natural” going on with the table already that it needed to have some precision aspects to it, as well. Hand plane accuracy, Level 2! When I cut the ends flush, I was very pleased to see this gap-free seam. This is the cut straight off of the Festool TS 55, if you’ve had some interest in buying one but were still undecided. Now that I don’t have a tablesaw, it is something I might consider buying in the future. I’ll be following this to see how you deal with the epoxy filled cracks. I have a few smaller voids on my table to fill. You mean as far as the finish goes? Or… what? After the epoxy cured, I scraped and planed it all flush (it was kind of weird, planing plastic). Then it just got sanded to the same grit as the rest of the table. I don’t have a detailed shot of it, but there were several areas where I had some shallow voids to fill. Unless you get right down put your eye 6″ from it, you can barely even tell they are filled voids. The voids in the larger gaps are a little clouded, but I don’t think has any negative impact on the appearance of the table. I suppose I could have dyed or tinted the epoxy black, but… that might have looked weird. My main approach with this whole project was that I’m not trying to hide anything here. 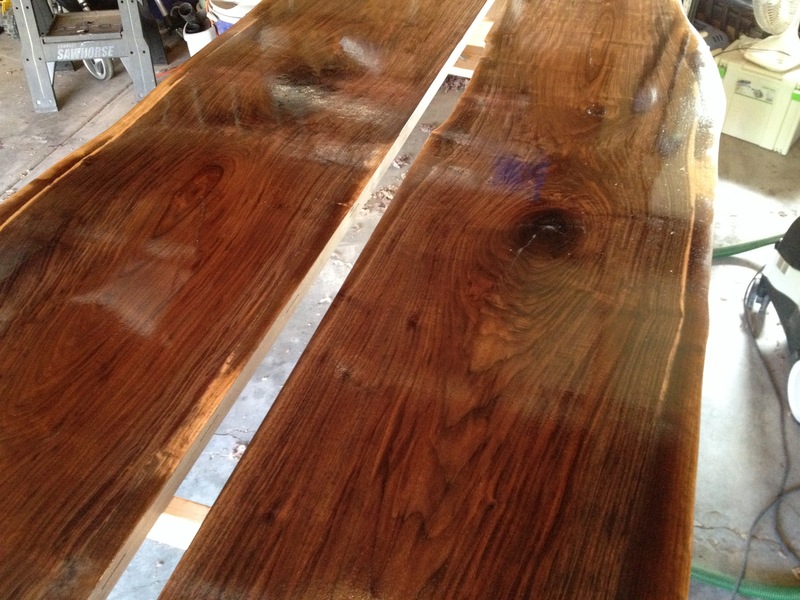 This is a wood conference table. 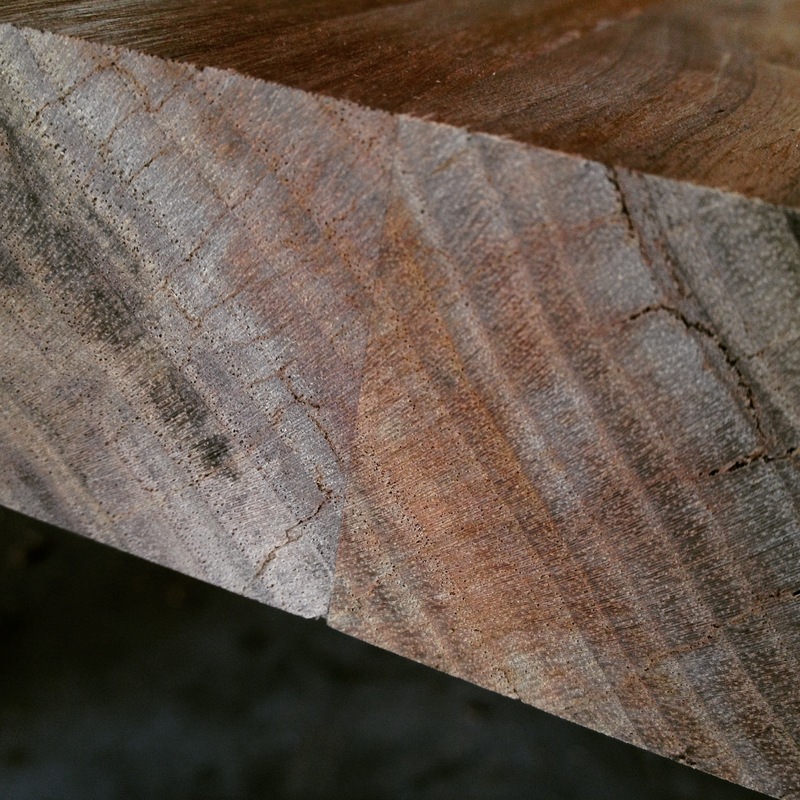 Wood has defects. Wood has grain. Wood has variance and texture and life. So I don’t mind so much that it looks like I fixed a void with epoxy, because that’s precisely what I did! It is also why I didn’t attempt to grain fill before or during the finish. I like a smooth finish you can rub your hands over, but I also like a finish that doesn’t detract from the fact that this is a wooden table, not a piece of laminate. I like the thought process on keeping wood looking like wood. As for the epoxy fill, I am concerned about how to level it – be it planing or sanding – and how it will look after a finish is put on it. Will it be scratchy or cloudy? I have two 3/8″ black holes in a cherry board to fill that I’ll be using epoxy tinted black. Well… It won’t look like wood, either way. I don’t know if this was cloudy because I did it in multiple pours or because it was such a deep fissure to fill. Like I said, in shallower areas, it’s perfectly clear and you can’t even tell it is there. I sanded it along with the wood (to the same grit) and it looks bad at that point, but it looks perfectly fine with the finish on it. My suggestion would be to make up some sample boards with holes in them, fill half of the holes with clear epoxy and half of them with black tinted epoxy and try your finishing techniques on them. When I think of black tinted epoxy, I think of the workbench Chris Schwarz made (and I think gave to Katie) where he tried to fill some cracks with black epoxy and he said it looked like crap and wished he’d not done it.